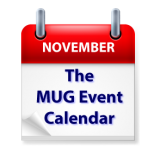 The holiday spirit gets an early start on this week’s MUG Event Calendar. Christopher Breen will speak to a New York group, while groups in Wisconsin and Pennsylvania will be talking about holiday gift ideas, and a New Jersey group will discuss wearable tech. Lots of iOS 8 and Yosemite topics are set up for the week, along with Parallels, productivity apps and a number of topics soon to be announced.